Google this week made significant change to its core productivity suite, including its email, online storage, and messaging tools. Gmail gains support for add-ons from the G Suite Marketplace, which will let third-party companies create small apps that can hook into an enhance Gmail. Google Drive earned a major overhaul. The new Drive now includes Team Drives for shared work spaces, Google Vault for protecting sensitive data, Drive File Stream for integrating with existing apps and tools, and Quick Access for advanced search powered by machine learning. Google Hangouts sees what is perhaps the most visible change, as Google split the messaging service in two. Moving forward, Hangouts' two major functions will be covered in separate applications, Google Meet and Google Chat. Meet is a video conferencing tool that Google says works via shared links; it doesn't require accounts, plugins, or downloads, and is accessible from PCs, tablets, and mobile phones. Further, Meet integrates with Gmail, Google Calendar, and other Google services. Google Chat takes features from Google's other services and packs them into a more powerful messaging app. For example, it supports virtual rooms for team conversations and works with Google Drive, Docs, and Photos for sharing files directly with the group. Chat also gains access to bots and third-party applications. The new tools will become available over time, according to Google. Hangouts Meet is available immediately, but Hangouts Chat is only being offered through an early adopter program. Google didn't detail how these changes will impact mobile users, but it's safe to assume many of the features will eventually be accessible from smartphones. Google today outlined a number of changes to its various messaging services, including a dramatic shift for Hangouts. Starting May 22, Google Hangouts will no longer support SMS for text messaging between phones. Google today added support for add-ons to Gmail on the web and Android devices. Add-ons allows power users to bridge Gmail with other business apps for smoother productivity and workflows. Google updated its Hangouts app for Android devices this week with a handful of new features. First and foremost, the app now allows Android owners to record and share video messages — a feature that's been in the iOS version of Hangouts for two years. 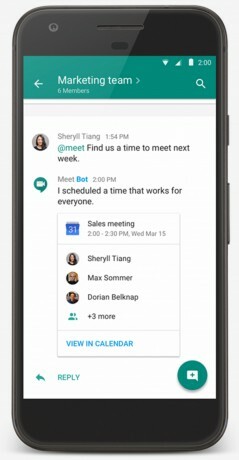 Google today said it has worked with several partners to develop Android add-ons for its Docs and Sheets productivity apps. The add-ons extend the functionality of Docs and Sheets, allowing people to accomplish more from their mobile phones. Google today introduced a wholly new version of Google Voice for Android, iOS, and the web. The calling, voicemail, and messaging platform has been overhauled from the ground up with a new design, new features, and a fresh commitment from Google to keep the service updated.